Aelred of Rievaulx (1110-1167) was born at Hexham, in Northumberland, but later became a monk and then abbot of the Cistercian abbey at Rievaulx, in Yorkshire. Among his many writings is an account of the saints of Hexham and their miracles. 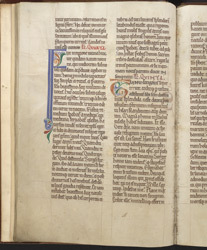 This manuscript has no explicit evidence to tell us where it was written, but the style of the initials does suggest it was produced in the north of England, possibly for a Cistercian abbey in Yorkshire: of the three manuscripts which survive, one is from Rievaulx, and another is also from Yorkshire; this one may perhaps be from Hexham. The text on this pages concerns St. Acca (d.740), bishop of Hexham (709-732). In the margin next to the blue initial 'F' is a faint letter 'A', a colour-note to the artist indicating that this initial should be blue (azure), and partially obscured next by the brownish initial 'T' is a colour-note 'B'.